I’ve heard that other air purifiers produce ozone as a byproduct. Does the Humanscale Personal Zone Air Purifier produce ozone? Isn’t the air we breathe on a day-to-day basis generally healthy? Since our lungs act as filters, does air quality really affect our health? Don’t centralized ventilation provided by HVAC systems keep the air in a building clean? 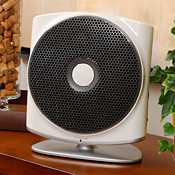 Question #1: I’ve heard that other air purifiers produce ozone as a byproduct. Does the Humanscale Personal Zone Air Purifier produce ozone? Answer: No, the Humanscale Personal Zone Air Purifier is ozone-free. It utilizes revolutionary DEP technology developed in Sweden–an improvement on the Electrostatic Precipitator (ESP) method of air purification. It operates at a much lower voltage and purifies much more efficiently than traditional ESP purifiers while producing no harmful ozone. Question #2: Isn’t the air we breathe on a day-to-day basis generally healthy? Answer: According to the American Lung Association, 50 percent of the U.S. population is breathing unhealthy amounts of air pollution. Air pollutants include dust, smoke, bacteria, allergens, smog, viruses and even Volatile Organic Compounds (VOCs), like formaldehyde. Some occur naturally; others are related to industry, transportation emissions and built environment. And, all either originate or get trapped indoors where people are spending upwards of 80 percent of their time today. Question #3: Since our lungs act as filters, does air quality really affect our health? Answer: The Environmental Protection Agency has identified indoor air quality as one of the top five most urgent environmental risks to public health. Breathing problems account for approximately 24.5 million missed work days each year. The Asthma and Allergy Foundation indicates asthma and allergies lead to $8 billion in lost productivity in the U.S. workplace annually. It’s clear that breathing fewer contaminants and irritants will result in improved health. Question #4: Don’t centralized ventilation provided by HVAC systems keep the air in a building clean? Answer: The filters on most HVAC systems are there to protect the equipment, not the building’s inhabitants. While they remove larger particles from the air, they are not designed to remove the more dangerous smaller particles, including smog, viruses and allergens. HVAC systems also require a high-level of energy to circulate the air, which many buildings sacrifice for efficiency and cost-savings. The result is recycled interior air with high levels of contamination. Go back to the Humanscale Personal Zone Air Purifier.